To go back a bit (since I'm still rubbish at the twin updates), I started with the potty last summer, I figured in the hot weather when we were mainly in the garden, often naked (them, not me!) it would be ideal to just get them used to the idea and judge how they would take to it. Priya did fantastically, often running to the potty for a wee, usually from the paddling pool and wasn't worried about it at all. Partly due to laziness and partly due to struggling to get K interested, I didn't really take it further than this initially but soon decided it was worth trying P in pants for a day. We soon gave up as indoors when clothed, she just didn't tell me when she needed to go, even with the same potty in the hall/bathroom. We never had any clues as to when poos might be imminent and they weren't always going at the same sort of time, it varied with both of them. They could be sitting right across from me at the table and I'd have no idea, stealth poopers these two! I couldn't get them to tell me if they needed a poo, short of asking them constantly throughout the day and even then, they always say no when asked. As a result, and the fear of doing two at once and worrying about wee and poo all over our house, having to deal with both if they need to go at once, I've left it until now to actually try to get them out of nappies properly. We do have two potties and one kiddie seat which sits over our loo (all IKEA) so realistically I can get them both on there at the same time but it's still a stressful thought. So, the next step we took was trying with stickers, to make it exciting and initially just ripped up a white label which they loved! If they ever managed to wee on the toilet, they got a "sticker" and were very proud but it still only happened occasionally, usually when we were getting them ready for bed. We decided to try promises of a chocolate button if they managed to do a poo on the toilet (totally against our usual no sweets rule, they usually get chocolate as a rare treat so we thought this would inspire them to try harder) we even tried the method I'd heard of of a chocolate for them if they pooped on the loo, if they pooped in a nappy, the chocolate was flushed away. THAT didn't work as they just loved watching us flush the chocolate and started asking to get to flush the chocolate themselves. Hmm. We invested in some fancy stickers, little rainbow hearts for wees and if they did a poo in the toilet, they could choose a safari style bigger sticker. 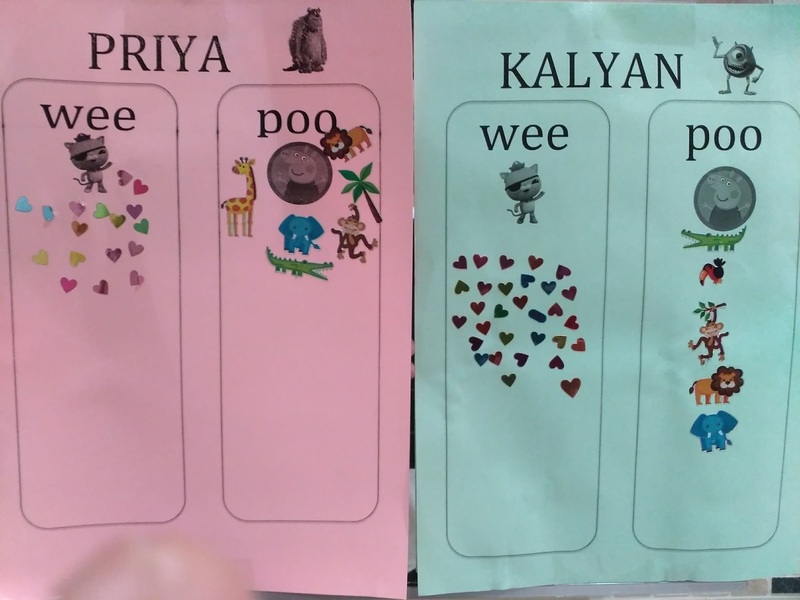 They loved the hearts and choosing a colour, we were getting more wees in the toilet at home but still only if constantly asking them if they needed to go so we started a sticker chart rather than just sticking them on their clothes, so they could see how many they had. I just wasn't sure how to get them to tell us if they needed to go and therefore was nervous to try pants again. 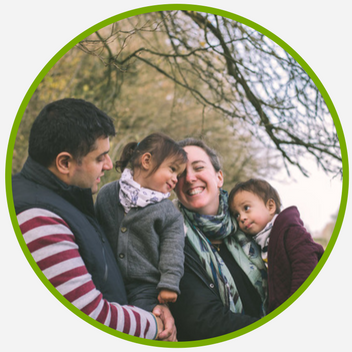 Our childminder has been particularly helpful, encouraging them there and giving stickers at the same time we started sticker charts but they agreed it was difficult to get them to communicate and to even know when they might need to go to the toilet. Priya took to it well at the childminder whereas we found Kalyan more interested at home. This only seemed to work at certain times though - mainly as an excuse to delay getting in bed! So until this last weekend, it's kind of been half-hearted and a bit hit & miss. Perhaps we could have been more pro-active with it sooner but I'm not convinced we'd have had the same result had we not waited until now. And so with the pants. I'd already invested in some back in the summer but they were too big and kept falling down, I managed to find size 18-24 month pants in Asda in a range of fab bright colours (in the boys section only may I add, grrrr!) and bought a few packs. On day one they each chose a superhero design, K's yellow saying "Super Hero" and Priya's red with "Pow" on the front. As you can see from the general frolics that followed, they loved their new pants! We mostly hung out upstairs in their room, chasing, playing, building towers. I was constantly asking them if they needed a wee, asking Nik's Christmas present, Alexa (affiliate link), to remind me every 15 minutes - very handy! I kept them in just pants at first so they could feel the difference but we put PJs on when it was a bit cooler downstairs. We made scrambled eggs, did some painting, watched a bit of Beebies. (I may have gotten nervous about the sofa and laid down towels for all of 10 minutes until they became a tug-of-war tool!) 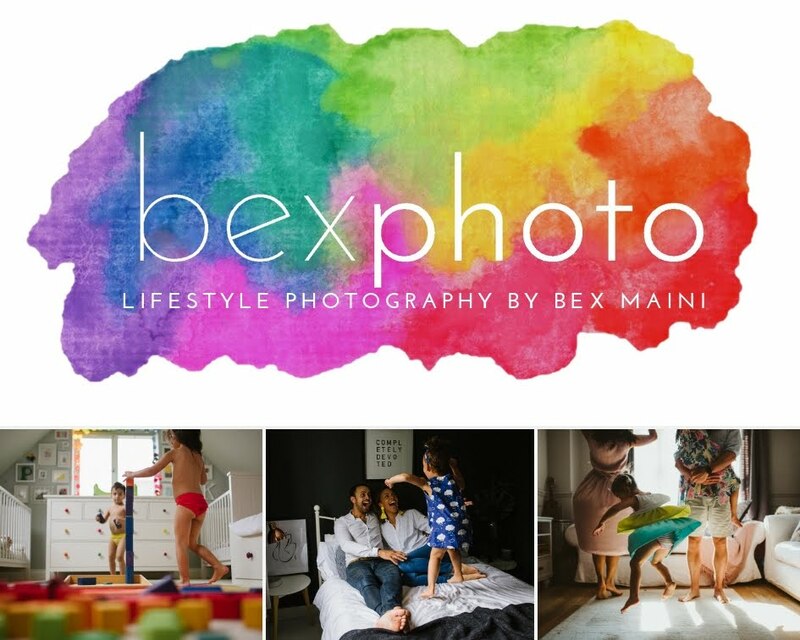 You can see our full "day in the life" from pants to nap time over on my bexphoto blog, I loved documenting our day, taking photos keeps me sane! They did pretty well and mostly said no when I asked but then I forgot to re-set the reminder and they did actually tell me when they needed to go. We had one accident when K had gone off in a tantrum after he was asked not to do something and then came back wet and upset which was soon turned around by green pants and painting fun! I did put them back in nappies for nap time which was when they both decided to poo! Typical! After nap carried on as before but with just one more accident from K on the dining chair at dinner time. Again nappies for bedtime but I made a big deal about how proud I was and how well they'd done and we cheered at their sticker charts for wees filling up and we had a similar day the next day with just one accident from P on the rug. When they did wet themselves, I didn't make a big deal and would just get them changed, wiped down and choose some new pants. They were already upset at being wet and I just wanted to reassure them. I went OTT when they did go on the toilet with high fives and lots of praise. The next day was a pre-school day so I'd emailed in advance to warn them and put plenty of clothes in the bags as well as some pull-ups in case it got too much, especially as they don't tend to nap there. Turns out I forgot spare socks! K had to borrow some socks and shoes and there was apparently one soiled pair of pants as well but I don't know whose as I was on a CPR course so Nik picked them up and didn't ask. They'd just told him the day was hit & miss. I wonder if it had been Priya as Nik said she got upset in the evening saying she'd done a poo in her pants but when he went to change her there was nothing there so maybe she'd done it during the day and didn't like it. He took her to the toilet and she did her first toilet poo! I got a text at the CPR course. It's quite hilarious sending each other poo texts now, I was all happy thinking about how proud she must have been. On Tuesday it was just me and the twins again and we had playgroup, I risked taking them in the car in pants as I had on the way to pre-school and again they remained dry, phew. The seat covers can be washed but they are a complete bugger to get back on the seats again! I started off asking them often at playgroup as I was worried they might forget while playing with their friends but they both came and told me when they needed a wee and both went on the kiddie seat in the church toilets. The rest of the day was also successful with only one wee accident from K, Priya was dry all day and even did a poo on the toilet again, this time asking to go for a poo. She had is sussed! From then on, there were no more accidents. They both did well at the childminder again, with nappies on for their naps but even those remained dry. Our usual routine post-CM pick-up is to do the food shopping, K now demands it in fact, he loves his free apple! I was a bit nervous this time as neither had pooped yet but we went anyway and I kept asking as we travelled the aisles. Eventually K wanted to wee so we abandoned our trolley by an empty till and all trudged off, Priya deciding en route she also needed a wee so she ended up going first. I had to hold them over the seat and she didn't need to go at all, we swapped over and she was behind me as I held K but as soon as I lifted him to the seat, a very loud alarm went off! I thought Priya had pulled a cord or something but she was innocent. K freaked out and wouldn't go near the toilet any more! Thanks Tesco - turns out it was a fire alarm test - a tannoy warning would have been helpful!